We’d love your help. 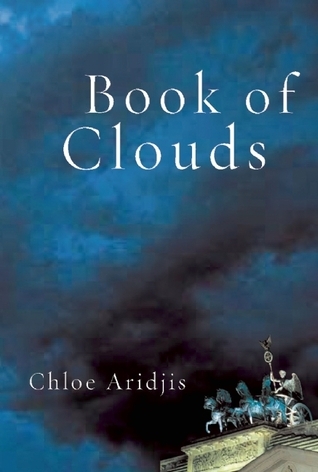 Let us know what’s wrong with this preview of Book of Clouds by Chloe Aridjis. To ask other readers questions about Book of Clouds, please sign up. Reading this was like lying on the grass and watching clouds. After two hours nothing truly happened, although something beautiful transpired and you feel like a poet. As the back cover would tell you ‘Book of Clouds’ is about a Mexican woman adrift in Berlin. I quite liked that this immigrant story did not include the British/American perspective. The world Tatiana came from and the world she came to are both foreign worlds to a regular British or American. Aridjis successfully married off Lati Reading this was like lying on the grass and watching clouds. After two hours nothing truly happened, although something beautiful transpired and you feel like a poet. As the back cover would tell you ‘Book of Clouds’ is about a Mexican woman adrift in Berlin. I quite liked that this immigrant story did not include the British/American perspective. The world Tatiana came from and the world she came to are both foreign worlds to a regular British or American. Aridjis successfully married off Latin American melancholy and magical realism with German modernism and suffocating history penetrating every street and every building. Some reviewers said they wanted to know more about the reason behind Tatiana’s disconnection with the world and her taste for escaping. It seems to me that those readers are used to those books where one secret explains all. Real life ain’t like that. Sometimes you just can’t connect with the world, because you can’t, and not because your dad accidentally killed your mother, or because your fiance ran away with your sister. I felt this book like I haven’t felt a book in a long while. I felt the bits about the light and the darkness, the bits about sounds invading your sleep, the bits about trying hard to keep your neurosis in check. And the part about wanting to move away and start anew knowing damn well nothing really changes. And of course, the bit about detachable shower heads. And when the old professor fumbled with a broken Dictaphone looking worried and helpless I wanted to cry and then Tatiana cried too and that’s when I decided I would give this book five stars. Why did this get magnificent reviews--a young / pretty author? So much of the writing was not good, the scenes obvious constructs. After a few chapters I thought: a ghost story. And indeed at the end the narrator notes that "there was little difference between clouds and shadows and other phenomena given shape by the human imagination." Is there any substance to this story? It's not just that Tatiana sees and feels and hears ghosts; every action, every thought, every word seems haunted by the past and the horrors of humanity. There is no anchor, no context to make anything real. Changes are too vast and unpredictable to find After a few chapters I thought: a ghost story. And indeed at the end the narrator notes that "there was little difference between clouds and shadows and other phenomena given shape by the human imagination." Is there any substance to this story? It's not just that Tatiana sees and feels and hears ghosts; every action, every thought, every word seems haunted by the past and the horrors of humanity. There is no anchor, no context to make anything real. Changes are too vast and unpredictable to find a place in. All is disguise, smoke and mirrors, chalk on the wall. In some respects the unresolved narrative reminds me of another book I recently read, "Event Factory". As with that novel the writing is crisp, precise, simple, yet also eloquent, creating tension with atmosphere rather than action. While there are some beautiful passages that I felt read true about my own experiences in Germany, the book lacked momentum and I wasn't fond of the narrators complacency, which oftentimes came across as mopey or listless. Tatiana's clouds or dreams or delusions, or whatever you want to call them, weren't interesting enough to make me feel connected to this "slice of life" story. "Book of Clouds" is one of the must-reads of 2009. As Wendy Lesser wrote in The New York Times, "First novels by young writers who see the world with a fresh, original vision and write about it with clarity and restraint are rare enough to begin with. When you add in the fact that Chloe Aridjis’ “Book of Clouds” is also a stunningly accurate portrait of Berlin, as well as a thoughtful portrayal of a young Mexican Jew drifting through her life abroad, this novel becomes required reading of the most pleasurable sort." The Los Angeles Times reviewer noted that "Magic and poetry are everywhere in "Book of Clouds," and the reader who can appreciate 'the fogs of time and the obfuscation that surrounds them' will find here an unsettling atmosphere unlike anything in recent fiction." And Eileen Battersby, Literary Correspondent of The Irish Times, has written: "AND NOW for something completely different: Chloe Aridjis brings a bit of realism, a bit of wonder, a hint of darkness and true originality to this sharp, lyric and beguilingly strange tale of a life in flux...this book is irresistible... "Book of Clouds" soars and shimmers through its assured writing, whimsical observations and its sheer ease. It is a story about thinking concerned with questioning life and drifting through it; it’s about knowing that sometimes even trying to take control is a waste of time..,,,Aridjis, at this early stage of her career, has learnt the value of less is more. Every nuance counts in this virtuoso performance. You feel yourself transported to Berlin, more importantly you feel as if the narrator is addressing you because she believes you will understand...Aridjis knows all about conveying the complex inner life of the mind. Her feel for characterisation is instinctive and true. "Book of Clouds" is what happens when a gifted writer heeds her masters and also listens to herself...memorable offbeat, engaging and compelling narrative with its wry intelligence and grasp of the darker fears of the imagination." Debut av nu Londonbaserad mexikansk författare med fett kulturellt kapital. I Frankrike förärad 'Prix du Premier Roman Etranger'. Ojämn, men är ju svag för melankoliska flanörromaner. Berlinmiljön är mkt bekant och härlig, med S-bahnnörderier och Fernsehturmkärlek. men bjuder också på nya bilder i huvudet, t.ex. molnfantasten som sitter på 18:e våningen i sitt Plattenbau i Marzahn och pratar alltmedan han omedvetet skapar egna mentholcigarettmoln. #BOTNS-bingo: Självgott fnissande kryssar jag kat Debut av nu Londonbaserad mexikansk författare med fett kulturellt kapital. I Frankrike förärad 'Prix du Premier Roman Etranger'. A very quiet, meditative book about a Mexican woman adrift in Berlin. Tatiana is alienated from her family and her friends, cut off from the rest of the city, uninterested in forming a relationship with anyone. She gets a part-time job doing transcription work for a historian, goes on a few lacklustre dates with a fairly nondescript meteorologist, becomes slightly obsessed with a mentally ill woman, avoids her neighbours, develops insomnia. The book meanders along like this for most of the 200 p A very quiet, meditative book about a Mexican woman adrift in Berlin. Tatiana is alienated from her family and her friends, cut off from the rest of the city, uninterested in forming a relationship with anyone. She gets a part-time job doing transcription work for a historian, goes on a few lacklustre dates with a fairly nondescript meteorologist, becomes slightly obsessed with a mentally ill woman, avoids her neighbours, develops insomnia. The book meanders along like this for most of the 200 pages, as aimless as the passage of a cloud across the sky, before something quite dramatic happens almost out of nowhere. This, it seems, is a major theme of the book. There’s not too much background about Tatiana’s life in Mexico so it’s never very clear what she’s trying to blot out, but she is definitely trying. I read in an interview that an earlier draft of this book had more of the Mexican backstory included, but was cut out from the final version. The effect is to leave much unanswered, which can be a good thing, but it also made it difficult to understand the character’s alienation. Essentially a brooding, atmospheric illumination of the city of Berlin. The city is certainly the co-main character of the novel, at least, and it feels here like a dark, dense stain sinking into the fabric of the universe. It is the shadowed spot left on the wall of the empty apartment above the protagonist that is not covered up even when a new tenant arrives to rehabilitate the space. It is the secret underground bowling alley of the Nazis, or the Stasi, it makes little difference which, wher Essentially a brooding, atmospheric illumination of the city of Berlin. The city is certainly the co-main character of the novel, at least, and it feels here like a dark, dense stain sinking into the fabric of the universe. It is the shadowed spot left on the wall of the empty apartment above the protagonist that is not covered up even when a new tenant arrives to rehabilitate the space. It is the secret underground bowling alley of the Nazis, or the Stasi, it makes little difference which, where the ghosts impatiently wait to reclaim the place. The tone is brilliantly set from the opening paragraph: "It was an evening when the moral remains of the city bobbed up to the surface and floated like driftwood before sinking back down to the seabed to further splinter and rot." Now there's a sentence to make any city's Chamber of Commerce fall to its knees in pain. The narrative vehicle for this contemporary analysis of Berlin is the story of Tatiana, a young woman from a Mexican Jewish family, who has lived in Berlin for several years. She muddles along in the post-German reunification haze, working part-time for a historian, transcribing his spoken notes. She has difficulty making any real connection with people or work and bounces along on each path, unable to settle anywhere for long. Berlin's past seems to colonize her imagination, leaving her unbalanced in the present. Ultimately an act of violence (with a resolution from the school of urban magical realism) prompts her to sever ties with the city and return to her family in Mexico. This book freaked me out a bit at parts as I celebrated 5 years in Hamburg while reading about the main character having spent 5 years in Berlin. I enjoyed the parts of life in Germany as I could so closely relate; however, at times it was also tedious because I felt like I was reading about parts of my every day life which I try to escape through reading! A lovely little book though though. This review has been hidden because it contains spoilers. To view it, click here. I was a little unsure of the chronology, of the narrator's age. She's 14 in 1986 but seemed to write as if in her early 20s in 2009. Perhaps that was the point. She was in limbo. I chose this book for its Berlin setting as well for its excellent reviews and lovely size. It is a pleasure to hold in one's hands and to read. What a contrast to the Dutch author, whose characters' musings seemed so false. Tatiana, a Mexican fluent in German and living in Berlin, is not an academic but every thought s I was a little unsure of the chronology, of the narrator's age. She's 14 in 1986 but seemed to write as if in her early 20s in 2009. Perhaps that was the point. She was in limbo. I chose this book for its Berlin setting as well for its excellent reviews and lovely size. It is a pleasure to hold in one's hands and to read. What a contrast to the Dutch author, whose characters' musings seemed so false. Tatiana, a Mexican fluent in German and living in Berlin, is not an academic but every thought sounded genuinely intelligent. Her professor, Doktor Weiss, though past his prime, rang true as well. Her Jewishness and the Holocaust was easy to forget. Look at reference's to her family's deli in Mexico and pages 182 "the exception of a few unfortunate years" and 187 "the old Jew probably laid a curse on us." The midnight visit to Berlin's monument to the murdered Jews of Europe where she reluctantly plays hide and seek with her date, is it a metaphor for today's Berlin. 33 Doktor Weiss preparing an essay on history and space in Berlin: "Spaces cling to their pasts, he said, and sometimes the present finds a way of accommodating this past and sometimes it doesn't. At best, a peaceful coexistence is struck up between temporal plans but most of the time it is a constant struggle for dominion. 61 Jonas, the East German meteorologist and love interest studies clouds especially. 73-74 The Simpleton of Alexanderplatz. 74 "The smile seemed to get in the way of language." 104 In thinking on her failed friendship with Sonia, a trainer, Tatiana wonders about one's inner landscape. This made me consider my own inner landscape, which I think would be an interior view, looking out. Paintings with views into other rooms--through doors--or outside--through windows--attract me. 139 Tatiana in bed at night: "me, the village idiot from Mexico who actually thought she knew Berlin and its inhabitants well enough to go up and demand answers to mindless questions only a tourist would ask." 143 Tatiana compares fingernails to days: "You would only notice the erosion if my hands were at rest, otherwise the nails still looked elegant, a harmonious blur, just like the days themselves, which passed without consequence unless you pinned one down and examined it too closely." 143 ff Midnight trip to Holocaust memorial: "the 2711 concrete slabs like a stalled army converging from all sides. Despite the hundreds of possible e hits and entrances it was hard not to feel an immediate wave of claustrophobia and disorientation, and wherever I looked I saw dark pillars..."
203 "Once you decide to leave, you view a city through an entirely different lens." 205 [Going home to Mexico] "The only way to move on is to avoid sentimentality about the past, especially the recent past, which will always try to reclaim you." I can sum the book up in one word: implausible. There's the fact the protagonist has lived in Berlin five years and hasn't met anyone who sticks with her. The book is also littered with words nobody uses in real life (at one point a character says 'Look at those noctilucent clouds'. They are a cloud expert, but you wouldn't just drop that into conversation without explaining yourself... this is just one example of the wooden dialogue featured in the book). Then the magical realism bit at the end I can sum the book up in one word: implausible. There's the fact the protagonist has lived in Berlin five years and hasn't met anyone who sticks with her. The book is also littered with words nobody uses in real life (at one point a character says 'Look at those noctilucent clouds'. They are a cloud expert, but you wouldn't just drop that into conversation without explaining yourself... this is just one example of the wooden dialogue featured in the book). Then the magical realism bit at the end that came out of nowhere. The most uneventful book I’ve read in a long time. First, there's a lack of anxiety on the character's part that she is so isolated, so without interests. She knows, in the novel, that she has no friends and often does nothing for weeks or months at a time, but she is not anxious about it: it's almost as if she is on a strong course of antidepressants, so that her condition doesn't affect her. Second, there's a lack of interest on the implied author's part that her character is isolated and without interests. The character is clearly occasionally delusional, but that does not seem to concern the implied author. It is, in the end, disengaging to read about a character who does not care to know more about herself, described by a novelist who doesn't seem to notice that there might be more to see. At the beginning of the book, the character imagines seeing an aging Hitler (as a woman!) on a train, and throughout the novel she remains convinced of what she thinks she's seen. At the end of the book, she hallucinates a dense fog that loosens locks throughout Berlin and causes posters to slip down from the walls. Because the character never doubts either event, the novel creates an opening: I expected the narrator to develop a story about her mildly, occasionally delusional protagonist, and I thought the novel would probably develop into a story about her decline. My missus was given this as a present by a friend who'd recently moved back to London, having spent six months in Berlin. We're not entirely unfamiliar with Berlin ourselves: we spent a few days there a couple of summers ago, and said friend showed us around. The missus didn't much like the book, and she warned me I wouldn't either, but I wanted to read something that wasn't set in the UK or US, and all of the local bookshops were closed for the extended bank holiday weekend, so I was stuck with My missus was given this as a present by a friend who'd recently moved back to London, having spent six months in Berlin. We're not entirely unfamiliar with Berlin ourselves: we spent a few days there a couple of summers ago, and said friend showed us around. The missus didn't much like the book, and she warned me I wouldn't either, but I wanted to read something that wasn't set in the UK or US, and all of the local bookshops were closed for the extended bank holiday weekend, so I was stuck with what I could find on our bookshelves. This was nice and thin, so it won. I hated the first chapter, and I don't think it would be too much of a spoiler if I told you what that chapter consists of: the narrator thinking she sees Hitler dressed in drag on the metro on a night in the late 80s. Yes, really. How teenage, how crass, how utterly boring. I very nearly gave up in disgust right then and there. But, since there was nothing else to take its place, I ploughed on. Many events seem plonked into the novel for no more reason than to justify the shoehorning in of some such writerly observation or metaphor, the vast majority of which are jarringly unilluminating. And nothing that happens ever matters, and none of the imagery comes to anything, and none of it leads anywhere. According to the cover of the copy I read, Paul Auster liked BoC, and I can see why. But... it's written with such brevity that it flies by in just a few hours, and somewhere along the way I did find myself enjoying it ever so slightly. Not every observation or metaphor is terrible, and not all of the plot points are uninspired, and at least one of the three main characters is fairly interesting. Berlin itself isn't really brought to life, nor is the narrator, nor is the perspective of an isolated foreigner in a city with history, but when all 209 of these gossamer-thin pages are placed side by side, somehow they combine to make a heftier, more purposeful thread than their initial weightlessness would lead you to expect. 2.5 stars if I could, but 3 not so begrudgingly. This book is lovely, it's prose in places as light as the clouds of the title, in places as dark. It's hard to know what other readers would make of it and whether to recommend it due to it's strong reliance on the topography of Berlin to create it's story and moods. I love Berlin, adore it, and I found myself mentally walking it's pathways whilst reading the book, finding myself in the grey shadow of the Fernsehturm or the more bohemian setting of Prenzlauer Berg. From the Geisterbahnhof (ghost This book is lovely, it's prose in places as light as the clouds of the title, in places as dark. It's hard to know what other readers would make of it and whether to recommend it due to it's strong reliance on the topography of Berlin to create it's story and moods. I bought this book only because the review on the back promised me Murakami-like experience. Even though I can see how Aridjis's writing is similar to Murakami's and although I enjoyed her novel, I couldn't help noticing that my mind wandered during some passages, as if the words and their meaning were not strong enough to hold my attention, something I never experienced with Murakami. Moving account of a city rich in history told by an ex-pat in Berlin after the fall of the wall. Still mulling over the richness of the imagery and the larger implications of the symbolism of the clouds. Ett måste om du fascineras av Berlin. This was annoying. Rambling. Boring plot. Nothing to grab onto. Okay writing, but not amazing. And since I read this yonks ago I can't remember the details. I really enjoyed the first 2/3 of this book. But if you have never lived in Berlin, don't speak German, and don't want to read a book that is essentially a woman's day dreams as she wanders through a city alone, this is likely not for you. If you have, you will absolutely love the first 2/3s of this book. If you happened to live in Prenzlauer Berg in the early 2000s, and, say, if you spent too much time transferring trains at Alexanderplatz, or happened to wander into the Wasserturm for an art s I really enjoyed the first 2/3 of this book. But if you have never lived in Berlin, don't speak German, and don't want to read a book that is essentially a woman's day dreams as she wanders through a city alone, this is likely not for you. If you have, you will absolutely love the first 2/3s of this book. If you happened to live in Prenzlauer Berg in the early 2000s, and, say, if you spent too much time transferring trains at Alexanderplatz, or happened to wander into the Wasserturm for an art showing to find out it was a place of torture, then this will be a delightful walk down memory lane. This review has been hidden because it contains spoilers. To view it, click here. Aridjis has a talented way with words and capturing solitude. The other redeeming parts of this book, the allusions to Berlin and Doktor Weiss’s constant struggle to make the past horrors visible in place, were important to me, though felt very intimate and perhaps not accessible for all readers. Besides these very positive aspects, I often wondered where this novel was going, as it was often quite meandering, without giving enough character to be redeeming. Additionally I was disappointed that i Aridjis has a talented way with words and capturing solitude. The other redeeming parts of this book, the allusions to Berlin and Doktor Weiss’s constant struggle to make the past horrors visible in place, were important to me, though felt very intimate and perhaps not accessible for all readers. An odd, quiet portrait of the city of Berlin and its divided past, with visits ghost U-bahn stations; pitch-black, underground Nazi bowling alleys; the echoing Holocaust memorial at night - from the perspective of a shy Mexico-raised woman on an extended working holiday. As a young tourist on a previous visit with her family , she saw Hitler on the train and became fascinated with Germany. She had arrived this time as a young adult on a Goethe Institute scholarship. [I'm not sure what Visa allow An odd, quiet portrait of the city of Berlin and its divided past, with visits ghost U-bahn stations; pitch-black, underground Nazi bowling alleys; the echoing Holocaust memorial at night - from the perspective of a shy Mexico-raised woman on an extended working holiday. As a young tourist on a previous visit with her family , she saw Hitler on the train and became fascinated with Germany. She had arrived this time as a young adult on a Goethe Institute scholarship. [I'm not sure what Visa allowed her to live there after that :-) ] She finds work transcribing a famous old historian's spoken research on the recent history of Berlin. She lives alone, and is reluctant to have relationships, but manages a hesitant, transitory one with a meteorologist (clouds, get it?) whom she was sent by the historian to interview about graffiti he drew as a child on the Berlin wall. "Everything here is shifting and shifting, but you can't forget it all forms part of a long continuum...Nothing ever vanishes." Chloe Aridjis was born in New York and grew up in the Netherlands and Mexico City. After receiving a BA from Harvard, she went on to receive a PhD from Oxford University. A collection of essays on Magic and Poetry in Nineteenth-century France was released in 2005. Her first novel, Book of Clouds, followed in 2009, winning the Prix du Premier Roman Etranger in France.